Our Collingwood flight school first opened in August of 2000. 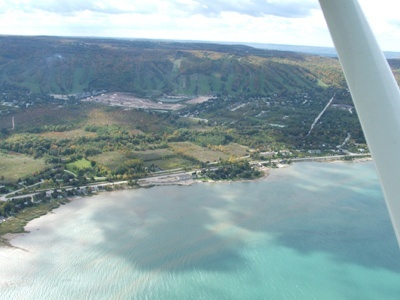 During this time we recognized the importance and demand for flight training in the Collingwood and Wasaga Beach area. We started with one Cessna 150 and it became quickly apparent that there was a requirement for a larger aircraft and decided to upgrade to a Cessna 172. 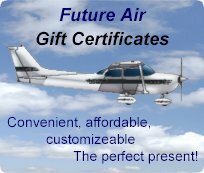 Since that time we have grown to include two Cessna 172s and two full time and one part time instructor. Collingwood boasts the most experienced staff in the area with two Class 1 flight instructors as well as a part time class 4 instructor. Collingwood has the advantage of being an uncontrolled airport. For the student, this means that you don’t have lengthy air traffic control delays and long waiting times to take off. Being located in a rural area also means that you won’t have to spend a lot of travel time getting to the practice area. The slower paced nature of uncontrolled airports will ultimately give a more relaxed training atmosphere. The beauty of the area can only be truly taken advantage of from the air. 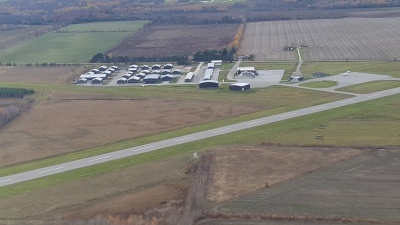 The Collingwood Regional Airport was established in 1967 on a site 8 kilometers south of the town of Collingwood in Clearview Township. The land for development of the Airport was purchased by the town in 1966. The initial grass runway (runway 13/31), developed by the town in 1967, was rebuilt in 1974 with federal funding assistance and was paved and lighted as a 914 m (3000 ft) runway. At the same time, a small public apron was constructed immediately east of the Collingwood Air Services hangar. In the 1970’s, a crosswind grass runway (runway 01/19) was constructed, 747 m. (2450 ft) in length. In 1981, Runway 13/31 was extended to 1219 m (4000 ft.). In 1988, with federal funding assistance, the town extended the runway to its present length of 1519 m. (4983 ft.) and, at the same time, widened the entire runway to 30 m. (100 ft) to conform to Transport Canada aerodrome standards. The hours of operation are 08:00 to 1700, 7 days a week (winter) and 08:00 to 1800, 7 days a week (summer). The Airport operator provides aviation services including the sale of Jet-A fuel and Avgas. 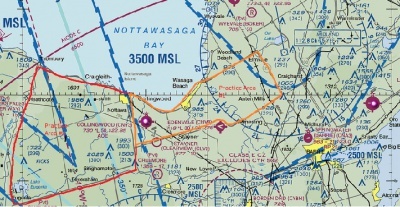 The east practice area borders Wasaga beach to Orr Lake south to Barrie and back towards Collingwood. Within this area most upper air exercises will be covered. Navigation exercises will also take place here during flight training, this will give you a chance to see how the ground relates the applicable aviation charts. The west practice area is over top of Blue Mountain. It borders Georgian Bay west to Thornbury south to Lake Eugenia and east to Singhampton. Our Collingwood office is approved to conduct the Transport Canada written examinations. When it comes time for you to write the practical Transport Canada written exam you can stay close to home in our professional yet relaxed atmosphere and not have to drive to Toronto to write. This exam is a computer based, the same as you would expect in a Transport Canada office. Our Chief Flight Instructor has been approved as a Pilot Examiner. He has been conducting the flight test for multiple years and has a very calm and professional approach to the flight test. When flight training in Collingwood you will get to know our CFI and his friendly demeanor; this makes for a slightly less stressful day when you are conducting your actual Transport Canada flight test. Being approved as a Pilot Examiner allows for ease for booking the flight test and hassle free rescheduling in the event of the test being postponed.